The final stages of the descent were carried live on television relayed through the Russian mission control center and NASA's satellite network, showing the last-second firing of the crew's braking rockets and billowing clouds of dust and smoke as the module touchded down and the parachute collapsed. 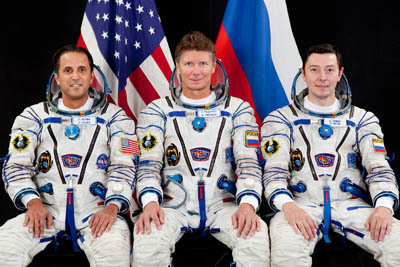 They quickly got to work opening the main hatch to help Soyuz commander Gennady Padalka, flight engineer Sergei Revin and Joseph Acaba out of the cramped module after four months in the weightlessness of space. Padalka, the first out, looked relaxed and in good spirits as he rested in a recliner and enjoyed a cup of tea. U.S. flight surgeons were on hand to provide initial medical checks before a two-hour helicopter flight to Kustanai.